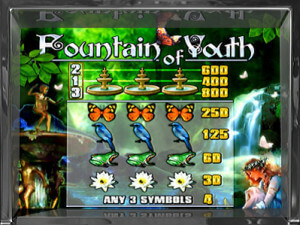 Fountain of Youth was released by Playtech. The Folklore themed game contains a set of 3 reels and 3 paylines. The visuals of the game features quality graphics with detailed art styles and textures which are based on the theme of a Fountain of Youth. The game features very soothing background music that is probably a blend of Harp and Piano sounds. The symbols on the reels are theme oriented and include fountain, Butterfly, blue Bird, frog and Flower. The highlight of the game is maximum payout of 800 coins. The game has 3 reels and 3 payline. The coin size varies in the denominations of 0.01 up to 5.00 per payline bet. The minimum bet amount is 0.01 and the maximum bet amount is 15.00 per spin. The Jackpot Payout is of 800 credits per bet line. Winning amounts of 10,000 or more are considered large wins. Large wins need to be verified by a live operator. The game comes with a user friendly interface wherein player gets to increase or decrease the coin size by pressing + or – sign. By pressing Bet one and Bet Max button, player can chose the number of coins to be wagered per payline. The game comes with an Autoplay feature wherein player can choose to automate the gameplay with a fixed value of spins as well as wager amount. This game is based on the theme of Fountain of Youth, which is a spring that supposedly restores the youth of anyone who drinks or bathes in its waters. Tales of such a fountain have been recounted across the world for thousands of years, appearing in writings by many famous historians. All the graphics and reel symbols of the game are designed in the same vein.